Core three apples then chop them into little bits in the food chopper (or grate them up). Add to sugar & butter, and mix in along with one egg and about 3 tbsp of milk. In a big bowl mix 2 cups of flour, 1/4 tsp each baking soda and salt, 1 tsp baking powder, and a generous sprinkling of cinnamon, nutmeg, and ginger. 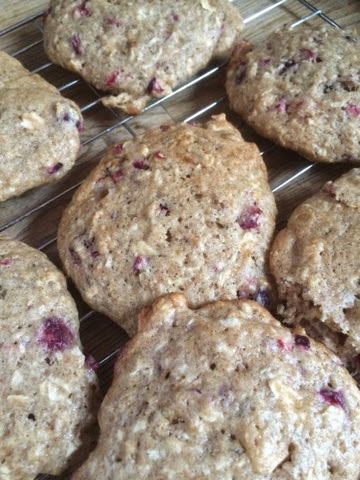 Put about a cup of frozen cranberries into the chopper and whir them into cranberry bits. Mix into the cookie dough. Spoon onto baking sheets and bake at 375 for about 15 minutes. Eat with a cup of strong tea... Or a glass of milk! We would like these!! Too bad we are not there - tea and cookies!! Mom & Dad Cranberry/Apple fans! They are a variant on a recipe from The Green Cookbook!